Do parents make better government leaders than childless people? This question has become a big source of embarassment for Andrea Leadsom, who is competing with Theresa May to lead the Conservative Party and become the United Kingdom's Prime Minister after David Cameron steps down. At issue is a newspaper interview with the London Times, in which she suggested that being a mother made her more qualified than the childless May. "I feel being a mum means you have a very real stake in the future of our country, a tangible stake," she is quoted as saying. I'm disgusted that Andrea #Leadsom has been reported saying exactly what she actually said. Shoddy journalism. Don't talk about your competitors - If you don't want to be caught comparing yourself with your competitors, don't compare yourself with your competitors. Don't even utter their names. Besides avoiding stiuations like Leadsom's, why would you give them publicity? Avoid ambiguity - Reading user comments on Twitter, there are obviously lots of people who strongly agree - and strongly disagree - with the headline. 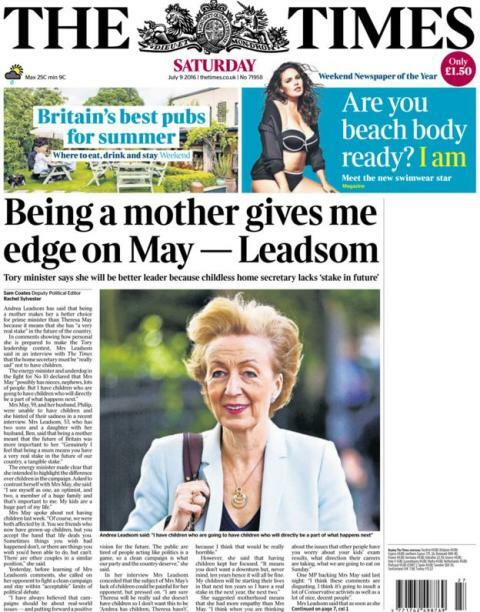 Whatever Leadsom's intentions were, she started this mother/no mother discussion to begin with. Don't go down a path which you don't want to go down. Be crystal clear with what you mean, and stick to it. Write your own headline - As you plan your interview, think about what headlines could at best - and at worst - be written atop your interview. Adjust your messaging accordingly. Record the interview yourself - the Times obviously had a transcript of the interview. Did Andrea Leadsom? As an interview guest, you should always have your own recording of what was said. Every smart phone has a voice recorder. Use it! The reporter is under no obligation to provide you with a transcript or the recording.